Up until last year, I wasn’t interested in Game of Thrones or any of the events that came to be on the show (#RedWedding), but with all the social media ruckus about Mr. Jon Snow, it peaked my curiosity just enough to watch the first episode of season 6 to find out whether or not he’d make it through… Except that, as avid watchers know, we don’t get an answer until the last moments of episode 2. By this point, a few other interesting things had happened, and let’s just say I’d found a new favorite thing to do with my Sundays at 9pm. I watched the rest of season 6 without any prior knowledge, something that came in handy with the episode “The Door,” because while everyone was distraught mourning the death of one of their favorite characters, I wasn’t anywhere near the level of attachment everyone had built over the prior 56 episodes. #HoldTheDoor crisis averted. Needless to say, I was hooked but also a little lost – as much as I picked up on things, there’s way too much ground covered in 5 seasons that cannot be deduced during 10 episodes, especially not on this show. But I also didn’t want to get hooked… So, I let months go by until I couldn’t wait any longer and I finally binged seasons one through five in a week, then re-watched season 6, feeling the proper things we’re all meant to feel (#RedWeddingVictim)… and this brings us to yesterday. 7.16. The date that has been tattooed on our brains for months as we anxiously awaited season 7 (not to mention it started at a later date and coming with less episodes than any prior season… see, it’s like I’ve been here from day 1! ), and this time I was on time and part of the gang! I had been victimized by George R. R. Martin, David Benioff and Dan Weiss along with millions of others, and I was ready to continue being a masochist, but I wanted to do it in style. 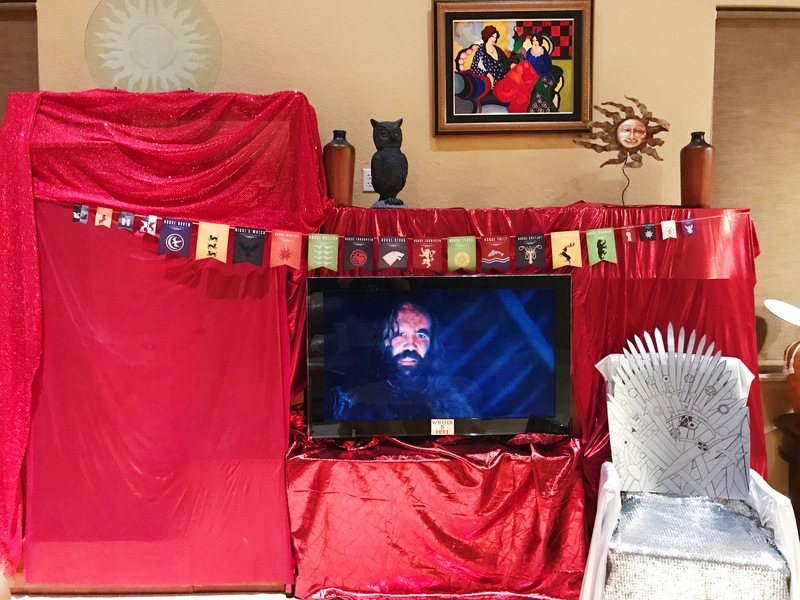 Thanking the old gods and the new for Pinterest, see below my Night’s Watch approved watch-party, which I must start by saying I was not willing to spend any money on. Everything you’re about to see was whipped up from items I already owned. I know, I’m a crafter and not everyone has these things handy, but I’m proud to say the only money I spent specifically on this party was a grand total of $6.40. Not wanting to spend money or get too into it, this silver poster board I already had would make the perfect back seat! So I went over my pencil drawings with black marker and boom! And now our pictures would look better! Found these shirts at Walmart for just $5 each, and the fabric was GREAT! In honor of Tyrion’s famous phrase! In honor of #GirlPower, #GirlLove, and to quote the all-around badass Daenerys Stormborn herself! Because Tyrion was in position, waiting, locked and loaded! That’s all folks! Hope you enjoyed seeing this watch party come to life 🙂 I’ll leave the decor up for the remainder of season 7. 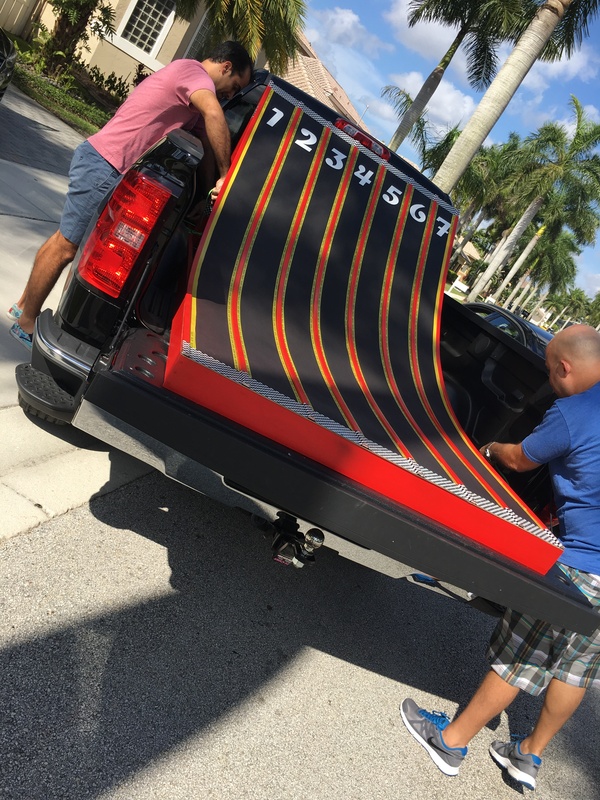 Have you done something like this for your own watch parties? Any ideas for upcoming episodes? Let me know in the comments below!